"Character may be manifested in the great moments, but it is made in the small ones," said Phillips Brooks, a guy who I don't know from Adam but just found a quote from through a quick Google search. Face it, comic books are about BIG moments. Planets blowing up and things being thrown into the sun and all that. And while that's fine and good, it's a lot easier to relate to the smaller things in life. 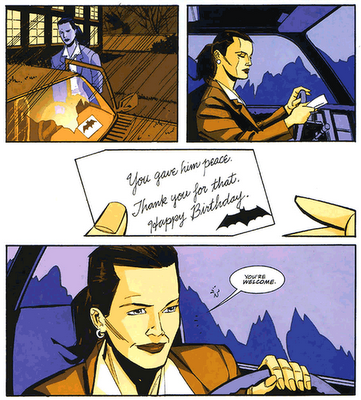 The single-issue story in Detective Comics #747 is all about a day in the life of Gotham police detective Renee Montoya, specifically, her twenty-ninth birthday. A small mystery crops up when an unsigned bouquet of flowers arrives on her desk. 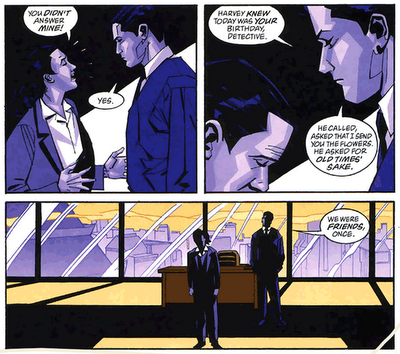 Amidst the day-to-day tasks of a detective, like testifying in court and putting up with obnoxious partners, Detective Montoya goes about solving the mystery of the unsigned flowers and finds out it was none other than Bruce Wayne who sent her the flowers. Since this takes place right after No Man's Land, during which Montoya caught the eye of Harvey Dent and/or Two-Face (you're left guessing which side (or both) is enamoured with her. Though the truth is revealed in Rucka's No Man's Land novelization), Montoya surmises Bruce Wayne did sent the flowers on behalf of Dent. This is the Batman I like: the one who still believes in redemption, who has a heart, who would do a favor for an old friend, which to me is much more heroic than just running around beating the stuffing out of criminals proclaiming you are the night. It's also the same Batman that was on the animated series back in the early 90's. Dammit, Dent! I said off the phone already! See? Even Batman knows villains need to be loved. Oh, and the type of flowers Two-Face sent Montoya? Tulips. Do you know how many times I read this story and STILL didn't figure out why it should be tulips? 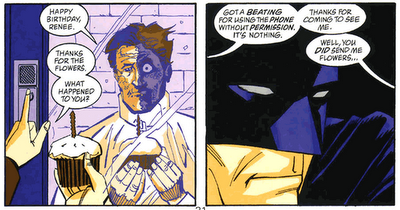 I also just realized now that the color scheme throughout this issue is made up of only two colors. I may not be the sharpest tack in the tool shed, but hey, that doesn't stop me from trying. Tulips? Now that's random, aren't there some two-faced flowers out there?